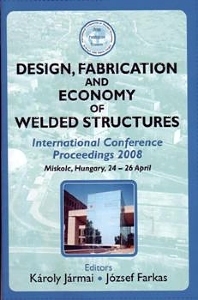 These proceedings cover the fields of different materials and fatigue of welded joints, thin-walled structures, tubular structures, frames, plates and shells and also incorporate special optimization problems, fire and earthquake resistant design, special applications and applied mechanics, and thus provide an important reference for civil and mechanical engineers, architects, designers and fabricators. Introductory paper; Structural optimization I; Structural optimization II; Fatigue design; Frames; Hollow sections; Plated structures; Residual stresses and distortions; Static stresses in welded connections; Application; Welding technology I; Welding technology II; Applied mechanics; Index. Karoly Jarmai, University of Miskolc, Hungary.